Custom team swim gear can help your team feel more team spirit. When you are part of a swim team, you are proud of that team and want to share with the world that you are a part of that team. In addition, any time you and your team make an appearance together, you can wear swim gear that shows you are part of a team together. Dressing alike in and out of the water provides a uniform look for your team from the swim caps and swimsuits you wear in the water to swim team t-shirts you wear out of the water. Swim caps are an important part of any swimmer’s gear. This cap hides the hair on your head and gives you a more streamlined shape so you can cut through the water more cleanly. While you can always choose plain swim caps in the same color for your swim team, creating custom swim caps with your team name, logo or mascot on it will ensure that everyone knows you are on the same team. These caps work well for relays to help keep track of teammates. Many swim teams choose swimsuits that match to help them look more uniform. You can purchase any number of swim team suits so you and your teammates are wearing the same thing in the water; however, what better way to create a sense of team spirit than to customize swimsuits with your team logo, mascot or special team colors. When your swimsuits are fully customized, you can show the world you are one united front against the other teams. Even when you are out of the water, you may want everyone to know what team you are a part of. Print up enough t-shirts for your entire team, plus parents or spouses, so your team can let everyone know that they are a team, both in and out of the water. These t-shirts can be in the team color with the team name, mascot and logo imprinted on them so there is no mistaking who belongs to which team. A swim teamisn’t any different than any other type of team in other sports. You want your team to have a uniform look while they are in the water, and it doesn’t hurt to look uniform out of the water as well. 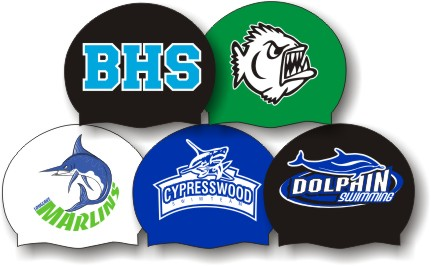 Ordering customized swim caps, swimsuits and t-shirts for your entire team imprinted with the team name, mascot or logo will ensure that everyone knows you are a team and work together.